Germany is not a growing country, in terms of inhabitants. For decades, the population has been decreasing rather than increasing. By rules of logic, then, there should be quite enough room for everybody, even if this trend were to be reversed in the long run by many people coming as refugees into the country. In Munich, however, this is not the case. There’s no point in being sarcastic, but housing is a major problem in the Bavarian capital to the point where we are approaching a situation like in London. And just as public administration is having massive difficulties in finding space for new accommodation for refugees, it is VERY difficult to find space for hosting a workshop, for example a theatre workshop, for example for refugees and non-refugees, for example in the framework of Phone Home. It’s not as if Pathos Theater, the German base of Phone Home didn’t have rooms at their disposal – there’s a rehearsal stage (“Pathos Atelier”) and of course there’s the traditional theatre space, the Pathos, a former ammunition factory that has been used as a stage since the 1980s; more prominently there’s the Schwere-Reiter-stage, that is used for bigger productions. However, when we decided to expand the theatre workshops that form the first part of Phone Home into a series of events that would last for half a year, Angelika Fink and I started looking for a room that could be permanently used for this purpose and grow with the project; we were looking for a room that could serve as a place where stories were collected and traces left – which, in short, would grow to be a temporary home for the participants and the projects. Such a room would have to be found in the neighbourhood, called “Kreativquartier” – an ensemble of old factory buildings that is to be “developed” in a few years, but is mercifully allowed to exist on its own for the time being – as a home to many cultural initiatives and institutions. The funny thing is – there’s lots of rooms available in this quarter, all belonging to the City of Munich, but for political, tactical and partly factual reasons, many of the buildings of the Kreativquartier are declared “in danger of collapsing” and thus barred. Nobody really knows how people, initiatives and institutions obtain admission to use one of the rooms – which happens in spite of the impending danger all around – so we plunged into the undiscovered country of administration and telephoned, wrote emails and formal letters, sneaked around officials and harassed them. We waited weeks and months and finally received an answer: Our project was absolutely worth supporting, but as we were not officially supported by the City yet, this was one problem and on the other hand the specific rooms we asked for were in “danger of collapsing” and no other rooms in the quarter available, so sorry we could not be helped. You’ve got to cope with disappointments when trying to organise such a big project, we thought. I very carefully kept note of the arguments and the tone of conversation, because, after all, this is the research part of the project. 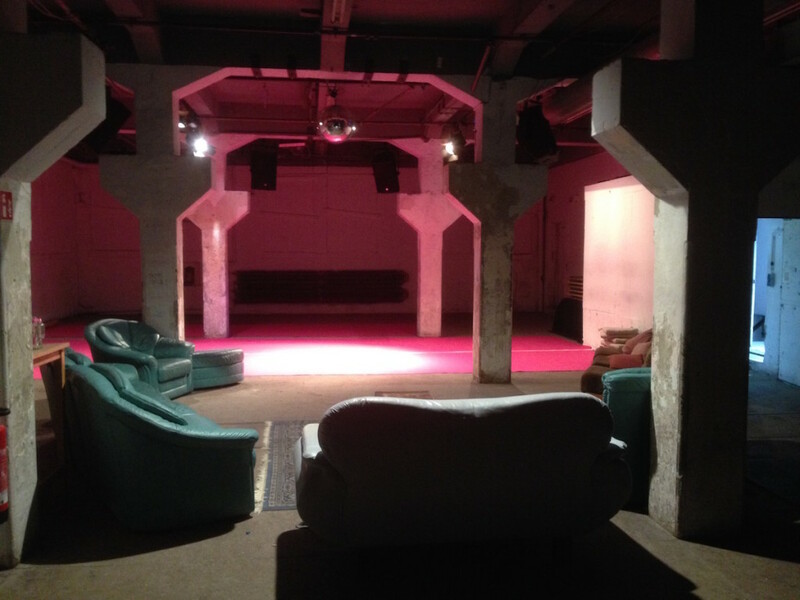 And, after all, there were rooms available, so Angelika Fink came up with the idea of dedicating the traditional Pathos stage itself to housing the workshops and re-modeling it into NEW PATHOS HOME – a place of encounter within the Kreativquartier, for those who have newly come as refugees and for those who have always lived here. Naturally, there’s other events that take place in the Pathos, so we had to change our plan in this respect: We would have to be nomadic after all, we wouldn’t be able to just pile up material in the room every week, but clear away most of our stuff after the workshops. Together with the other regular users of the Pathos, we are trying to find ways of creative work that may leave a trace but not impinge upon other activities – the first step in this direction is the world map we painted (led by Katrin Petroschkat, our stage and video designer) in one of our preparatory workshops, on which future workshop participants are invited to document the route they have taken in order to come to Germany. We had to organise a carpet for the floor, which luckily Antonia Puetz, our choreographer / costume designer managed to do as sponsoring, but this is one of the items that have to cleared away every time. For the future, there’s definitely more painting to be done – practical work together with kids from the refugee accommodation is something that will contribute in a very simple yet effective way to establishing communication – and leaving traces.